Quality filter housings are as important as filters to ensure that the filtration systems integrity is protected. Housings should therefore be made to the highest specifications to ensure system integrity. Spectrum offers a range of standard housings of various designs, to suit practically every type of filter, and end application. These housings are available in choice of materials, ranging from GI, powder coated MS, anodized or powder coated aluminium, and Stainless Steel. Spectrum Universal Filter Holding Frames are designed for simple and cost-effective construction / remodeling of filter banks. Its unique modular design is ideal for quick and hassle free installation at site. The frames come in a variety of standard sizes and can also be delivered in custom made sizes. The frames come with 4 quick clamp spring clips to ensure positive seal. The holding frames are available in Extruded Aluminum, Galvanised and Stainless Steel construction. A silicone free gasket is provided with the holding frame. Frame design assures secure installation and handling of filter. When once the low initial cost of the permanent frame is absorbed, the consumer purchases only the filter pads the heart of any filter system making the system extremely inexpensive. Frame design will accommodate all grades and types of fiberglass and synthetic Medias. Spectrum has developed for applications that require additional filter installation within a short time span or with space constraint. The housing can be delivered in a range of size to accommodate space / air flow. The Spectra conduit housing is supplied complete with filters installed in the universal holding frame. Customer can choose from a variety of filter types. Installation at site is easy and hassle free. The Spectra HEPA seal housing is designed to ensure that your critical HEPA filter is installed without any leakage. 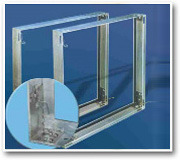 The flexibility of the HEPA Seal Frame makes it ultimate for several applications. Installing of HEPA filter is simple and leak free with the use of the lock bolt system. Spectrum manufactures state-of-the art fan filter modules incorporating a choice of mini - pleat HEPA filters or conventional deep pleat HEPA filters. Options of top mounted radial fan, or side mounted centrifugal fan are also available in the standard range. Prefilters incorporate UL certified media, to ensure extremely high module service life. Blowers are completely maintenance - free, low noise type. Modules with removable and replaceable HEPA filters are also available in the standard range. HEPA Terminal Modules use minipleat wet laid glass media with efficiency of 99.99% (HEPA) on 0.3µm particle size. Designed for easy installation and longer service life. These ducted modules are designed to optimize performance in filtration applications for the food, automotive, aerospace, optical and biotechnology industries as well as for surgical rooms in hospitals. Spectrum offers a wide range of HEPA hospital / clean air filtration modules for wall mounting (pressurizing type) or for ceiling mounting (recirculating type), including specific modules configured for Operation Theater duty, and with option of built in DX type air conditioning, ultraviolet bactericidal, and positive control of temperature, humidity and airborne particle level. Hospital / OT modules are specialized filtration modules incorporating additional features for bactericidal effect, as well as special provisions for surgical and general lighting, conduiting for anesthetic gases, and electrical cabling, and other customized features which are essential in a modem Operation Theater. These modules create a sterile environment in the 'critical' zone, and achieve zero bacteria colony counts in the wound vicinity. They are therefore extremely helpful in eliminating post-operative complications which arise due to infection.